With the exception, maybe, of VATS calling out your headshots, our modern mobile devices are shades more useful than the Pip Boy. Nonetheless, the Fallout universe's wrist-borne computer seems so much more essential and dramatic, probably because its analog hum, scanlines and fluttering screen make it all seem so close to a breakdown. In steps PipClock, an iPhone/iPad compatible homage to the Fallout device that's been available since the beginning of the year. PipClock is not itself a game, although, I suppose, you could pretend you're starring in one when you use it. It's a toy, something that gives you the time and the weather and a little extra with a healthy dose of alternate-reality presentation. 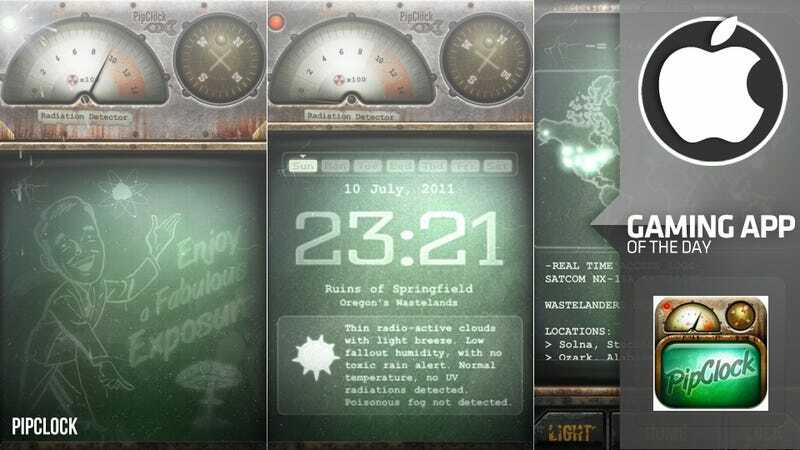 PipClock is not an official Fallout app and doesn't make use of any of its symbols directly (except the first three letters of its title) but it is unmistakably shown to be your post-apocalyptic digital survival kit, just like the Pip-Boy. The skin is a tarnished, beaten metal surrounding a washed-out, amber-hued display. Once the app acquires your GPS signal, you're given the local time, a weather summary, and a location descriptor. In my case, it was "Ruins of Springfield," with radioactive clouds covering the skies but no toxic rain alert. Elsewhere in your toolkit, you can see a more detailed weather report and a day/night chart with the moon phase. A "secret compartment" that you slide down reveals a compass and a basic map, and a Geiger counter whose activity seems to increase the more you point the iPhone at the floor. The map isn't terribly useful, providing no directions, just a rough location and distance. The compass works but then, so does the one in the maps program that does provide directions. It is cool to turn on the light application and hear it blink and drone when you use it the iPhone for its greatest improvised purpose: as a flashlight. There are some social features in the "Network" setting; an Access Log apparently shows who across the world has been using the app in the past 30 minutes. "Bulletin" is the Twitter feed of the app's creators. Shaking your device triggers an animation in which blast doors slide shut to the sound of an enormous explosion. In the end, this is a show-off piece for friends, or simply a diversion for those who wish to dress up some of the iPhone's functions in a more fun way. In such an app, the visuals must be superb, and PipClock's are. At 99 cents (and with a free lite version) it's a must for anyone who's ever daydreamed about surviving the day with their wits and their trusty digital device.